Resurrected from the bowels of the Open Marketplace comes the thread once known as the "non-3DO Trading Album". Let us know what you've acquired....... <oldtxt>This is a thread for posting a quick message, with or without pictures, whenever you buy/trade something non-3DO related. Last edited by 3DO Experience on Tue Jul 10, 2012 12:47 am, edited 3 times in total. mattyg wrote: I have acquired in the last two weeks a boxed virtual boy , a boxed Mega CD II , a boxed Lynx II , a boxed PC Engine and a boxed CD32! Last edited by 3DO Experience on Tue Jul 10, 2012 12:40 am, edited 2 times in total. I got an extra Sega Genesis controller. Woop dee doo! It was cheap and the only ones I had before are a crappy joystick and the one that comes with the LaserActive. I bought a refurbished Pro edition of the 360 for $150 with all original items included and the box. I also got Dead Rising for $14. I then gashed my fingers open when hacking the 360 a/v cable so I could have enough room to stick in my HDMI to DVI converter. Fun times. I got my Sega Master System. $30. Console, AC adapter, A/V cable, original controller, 3rd party controller, a lightgun, and 3 complete games (Safari Hunt & Hang-On, Rambo, and Thunder Force). Shadow The Hedgehog for the Xbox, $5 lulz. Vid Grid is great, the Jaguar and AVP did not come in the trade, the shot just looked better with them than without. Last edited by 3DO Experience on Sun Oct 21, 2012 5:31 pm, edited 1 time in total. Just got a Memory Track Cart for the JagCD. Super NES DOOM, complete in box, $3. 3DO Experience wrote: Super NES DOOM, complete in box, $3. 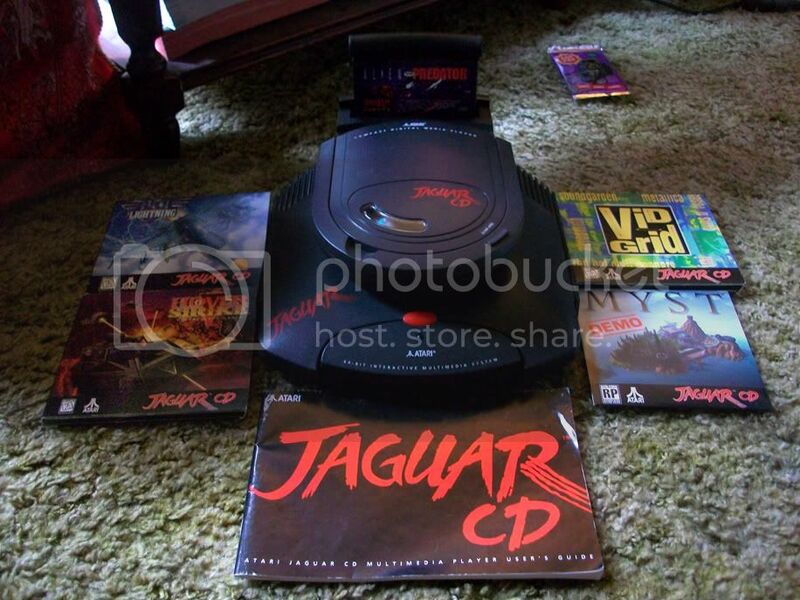 The Jaguar version is great. 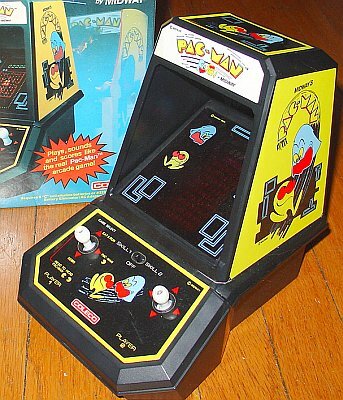 Pacman Handheld Arcade Cabinet, $1 and it works! *It’s funny I saw this vender last year and she had this NES joystick that she wanted about three times what it was worth, I offered her only double and she turned me down. I see her this year and she has this Game Gear out (with 6 working batteries in it) for $25, I told her I wanted it but wanted to look at the NES games she had, she pointed out the regular price ones and then pointed to a pile she said cost more because they were “rare”... yeah Super Mario 3, Zelda... you know the stuff you don’t find anywhere, why this woman gets into video game stuff is beyond me! Last edited by 3DO Experience on Tue Jul 20, 2010 1:19 pm, edited 1 time in total. Maniac Mansion 2: Day of the tentacle - original CD version boxed and complete for only £1. UFO: Enemy Unknown and Syndicate double set - boxed and complete for just another £1. The Settlers 2: Veni, Vidi, Vici - boxed and complete and yes it was just another £1. Got another GameGear today with 7 games (plus 2 GameBoy carts) and a power supply for $10. The GG was beat up but it's screen was better than mine so I swapped out some of the parts and broke a battery "spring" off of one and burnt the power input of the other. Heh so now I need to have someone soldier it for me. The cat in the picture kept mumbling something about Kilrathi , Hobbs will here about this , damn those eyes on the Jag box look hot and why does he keep getting stuff from Japan without sushi. 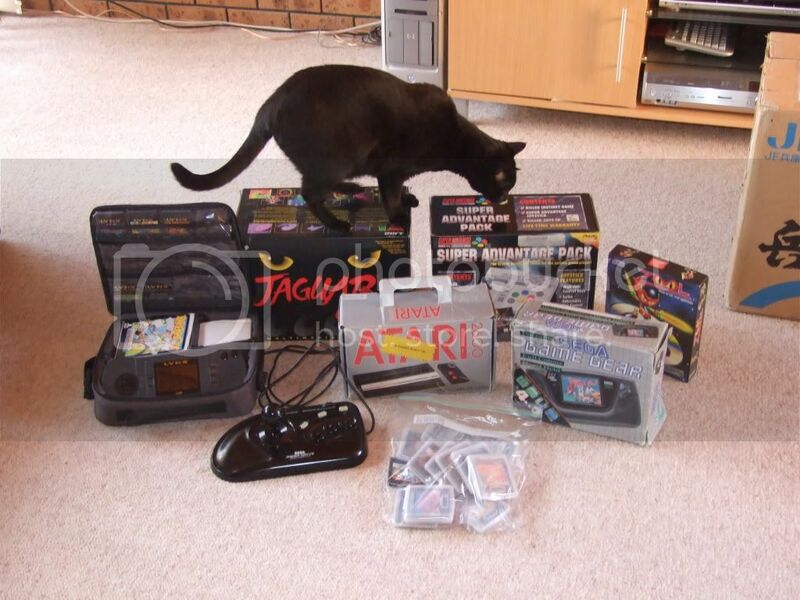 On the left is a Lynx I in excellent condition with original bag , power supply and games , next is a boxed Jag CD , a sega mega arcade stick , boxed Atari 2600 Jr , boxed Sega Gamegear (with 12 games) , brand new Killer Instinct pack for the SNES (arcade stick , game , soundtrack) and boxed Zool game for the CD32. and yes I probably paid way too much for all this! Won Puyo Puyo Fever for the Dreamcast. One of the best things was reviewing the bids, and I managed to pip someone by 2 pence. Also recently won Glimmerati for the N-gage. As far as I know this game should command at least some auction interest, but I managed to win it for the princely sum of $0.01US . I'm having to pay $12.50US to ship the item to my country. Oh and there was some crappy WWF game in the DreamCast. I thought I had 2 TremorPaks but they were both 3rd party memory cards with no screens. Got an X-BOX today for $25, no game or controller though. Those are all good Lynx games, California especially! I love the original Crystal Mines for the NES.